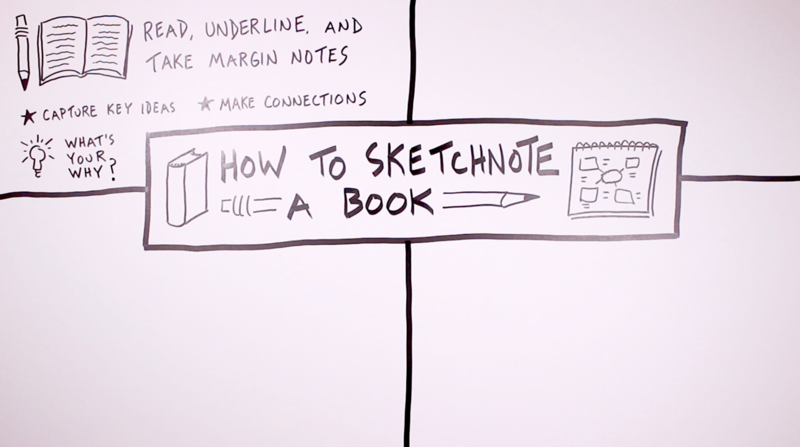 Today I’d like to share with you a process that I’ve been using to sketchnote an entire book. 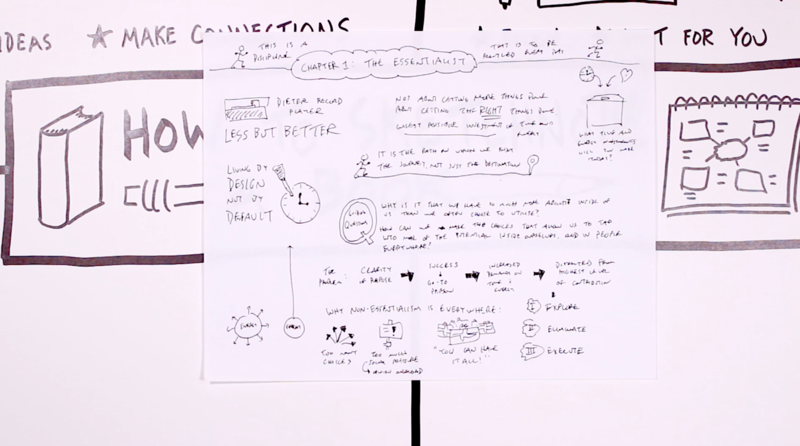 The process that I’m about to describe is one that I used to help me create the visual summary of the book Essentialism that I shared in last week’s video. The process that I follow has four steps to it. The first step probably isn’t that surprising. You begin by reading the book. Step 1: Read, underline, and take notes in the margin. While I’m reading I also underline passages that stand out to me and take some notes in the margins. The goal here is to be an active reader as opposed to a passive one. That’s why I enjoy using a pencil to make marks directly in the book. But I also seek a balance so that I can stay in the flow of the reading process. I’m not spending too much time going off on my own tangents, but instead stay immersed in the reading experience. While I’m reading there are really just two things that I’m doing. I’m underlining the key ideas–the most important ideas from the book, those that might be new to me or feel significant. I’m also making connections, connections to other books that I’ve read, other authors, and other ideas. I also make connections to my own personal experiences, often related to some significant event or insight from my past or something related to a current project that I’m working on. It’s via the margin notes that I capture those connections. That’s a way for me to personalize the reading experience, to integrate the things that I’m learning about into my own current understanding of the world. I encourage you to do something similar as you’re first reading through a book. Find a way to capture the ideas that stand out to you and make connections to things in your past, your present, and maybe even your future. To help you narrow down what you capture and decide what types of connections to make, I think it’s worth identifying why it is that you’re reading this book in the first place. Here’s an example of what my in-the-book notes look like. It’s mostly underlining, occasionally some icons like a star or a book or a magnifying glass, and some short bits of text in the margins to remind myself of things that I want to follow up on or connections that I have made. So that’s is for step one! You get to read the entire book while capturing some notes via underlined passages and the space in the margins. Let’s move to the second step in this process. 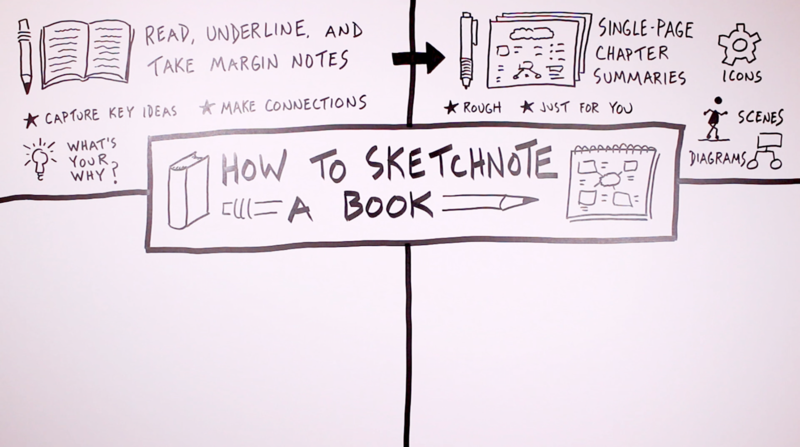 It’s in this second step that you start sketchnoting, with single-page chapter summaries. 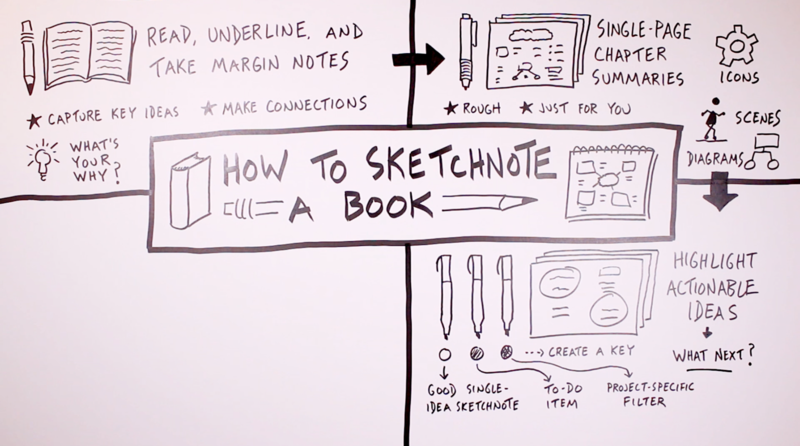 Step 2: Create a rough single-page sketchnote for each chapter. I grab some cheap copy paper as I flip back through the book one chapter at a time and pull out the ideas that I underlined and the notes that I took in the margins. It’s in this step that I actually take the time to visualize the ideas with three primary categories. Sometimes it’s just a simple icon that I might use alongside some helpful text. In other cases I might use a scene, often involving a human doing something, interacting with some other objects or on some sort of journey. I’m also on the lookout for when diagrams might be helpful, when the ideas that I’m capturing might be best expressed in a flow chart or a mind map. So it’s with those three categories of visualizations (as well as helpful text surrounding those visualizations) that I capture the ideas within each chapter, limiting myself to one single page. That single page constraint helps me avoid the tendency to capture too much. I don’t want to rewrite the entire chapter, I simply want to pull out the most engaging ideas. When creating these single-page chapter summaries, it’s important for me to remind myself that I intentionally want them to be rough (as opposed to polished) notes. These notes are just for you. They’re not for anybody else to look at or benefit from. That takes away the pressure of wanting your notes to look artistic and helps you to shift your focus from looks to impact. Here’s an example of what my single-page chapter summary sketchnotes look like. Often I do end up filling the page, but I’m not afraid to leave a bunch of blank space if in any given chapter there are only a couple ideas that stood out to me, ideas that I want to remember and revisit. So throughout this entire process it’s important to always be personalizing your note-taking and what you choose to capture in a way that emphasizes what you want to get out of the experience. 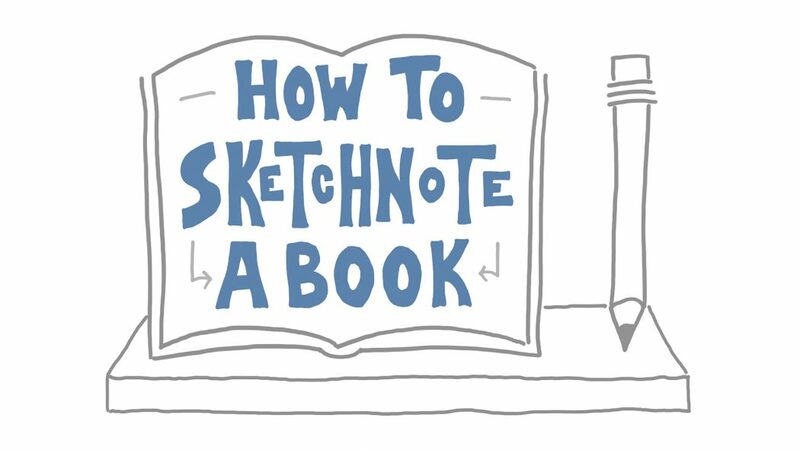 By completing sketchnote summaries of each chapter what you end up with is a quick reference, a way for you to dive back into the material from any given chapter and quickly see the ideas that stood out to you, those ideas that you might want to do something with. 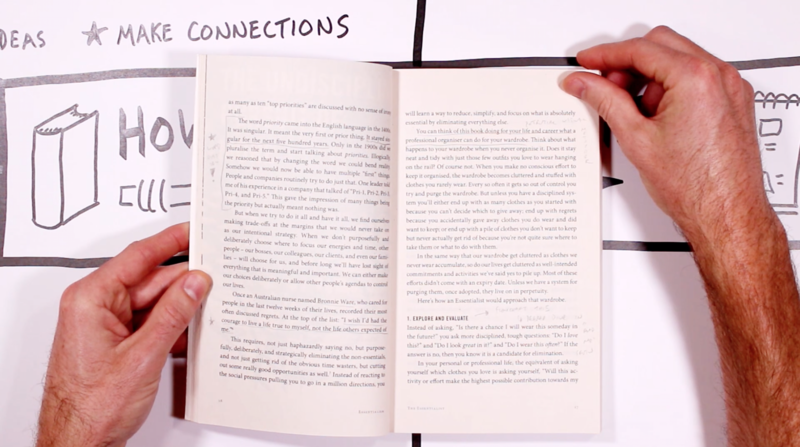 In this third step we put the pen down and grab a few highlighters for the purpose of identifying actionable ideas, looking through those single-page chapter summaries and identifying what you want to do with the things you find there. Step 3: Revisit your single-page summaries with a few highlighters to mark the ideas you want to follow up on. For me, the most appealing thing about sketchnoting is how it can close the gap between ideas and action, and that’s what we’re getting at in this step. Since there might be different types of follow-up actions that you’d like to take with the ideas from a book, it can be helpful to create a key. Think back to your original why for reading the book and use that to identify the specific categories of follow-up actions. 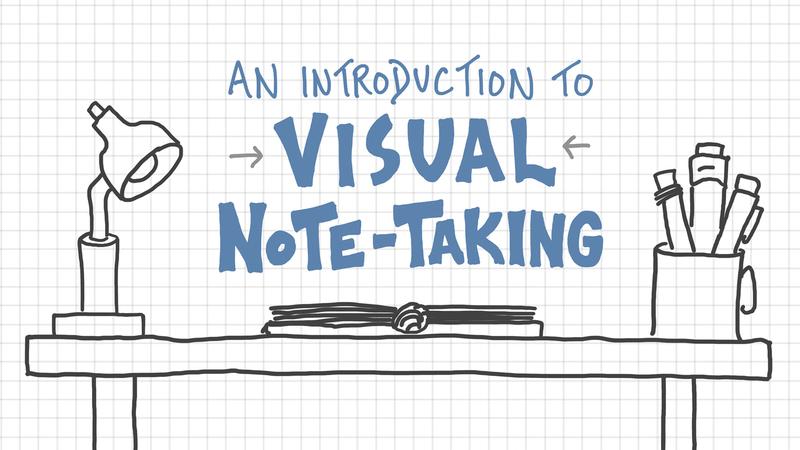 I often use one color to identify good single-idea sketchnotes. That’s for the ideas that have really stood out to me and when I enjoy the particular scene or diagram that I created for it, something that I might polish up a little bit and share on Instagram, for example. I might use a second color to highlight any to-do items. Oftentimes connected to key ideas are some specific follow-up action that I want to take on a current project of mine, and unless I find a way to highlight those specific follow-up actions I might forget to take them. I might not incorporate the ideas that I’ve just read about as directly as possible, as directly as I intended to. Finally, I often use a third color to highlight ideas that are related to a current project of mine. I give that highlighter a project-specific filter. Those aren’t necessarily specific to-do’s related to that project but more ideas that I want to keep in mind whileI continue to develop that project and make progress on it. Now that you’ve captured the most important ideas in your single-page chapter summaries, what do you want to do with those ideas? After you’ve answered that question, you might want to take it one step further. This fourth step in the process is one that I consider to be optional: a single page summary of the entire book. 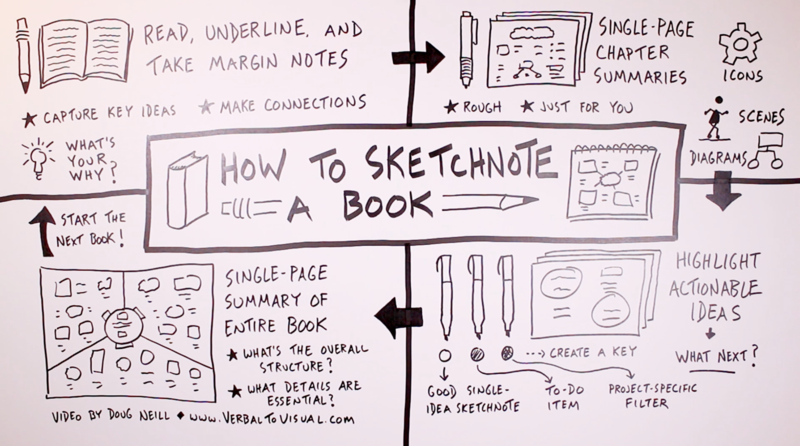 Step 4: Create a single-page sketchnote summary of the entire book! If you choose to create a single-page summary like this I think there are two important questions to ask yourself. The first is this: What’s the overall structure? In the case of Essentialism that was pretty easy to identify because the way in which the book was laid out. After the first section of Essence, the three that followed (Explore, Eliminate, and Execute) made it pretty easy for me to divide the page of my whole-book summary into the three sections that you see. So in many cases something along the lines of a mind map or a flow chart will work well. But you could also be on the lookout for a single scene that might be the anchor for your book summary. If there’s a single strong visual element that’s used throughout the book (like an object or a particular situation) use that as a large container within which you can include the most important details. And that leads us to the second question to ask yourself: What details are essential? You only have a single page here (even if it is a large page) so you’ve got to continue refining down and asking yourself: what are the most important ideas here that I want to remember? Throughout each step of the process that I’ve described we’ve been focusing on fewer and fewer ideas. You first go from the entire book to just those things that you underlined and noted in the margin. From there you’ll probably only pick some of those things that you underlined to include in your single-page chapter summary. And on each of those pages you’re probably only going to highlight a couple of things. And it’s one final stage of filtering if you choose to create this single-page book summary. That can be a difficult process–deciding which things to exclude at each stage. But it’s that work and those decisions that will help you to do something meaningful with what you read. Because the whole purpose behind putting in this effort when reading a book is so that one month later or six months later, rather than not really being able to recall many of the details from the book that you read, instead you have these artifacts of your learning, and specific actions that you took because of them. So consider using the process I outlined above when you start reading your next book. As always, feel free to tweak any of the details to better suit your circumstances and your needs as you work toward a book sketchnoting process that you’re happy with. I hope you enjoy whatever book you dive into next and that you also enjoy actively engaging with the ideas that you find in it.